Certification, badges and reports are extremely important features of your LMS. These features ensure that your learners stay motivated and that their efforts are being recognized which aids better results. At the same time, you are also able to keep track of your own learning processes and make the right decisions and changes to your curriculum. What will you learn in this section? The Certificate module creates PDF certificates/diplomas for students in a course and can be customized by the certificate settings menu. There are several customizations we can make such as adding borders, watermarks, seals, signatures, outcomes, grades and even adding custom text. See the example below. To create a custom Certificate watch this short video. Users with teacher or administrator access can review a report of all issued certificates within a course by clicking on the View issued certificates link. Badges are a good way of celebrating an achievement and showcasing progress. Badges may be awarded based on a variety of chosen criteria. They may be displayed on a user’s profile as well. Site badges – available to users site-wide and related to the site-wide activities, such as finishing a set of courses. Step 2. Now click on Add new badge button, this will take you to a new page. Fill in Name, Description and put an image/icon of this badge. You can also set an expiry date for this badge, once done click on Save changes button. Step 3. 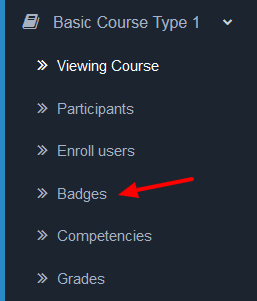 Create criteria for this badge from the dropdown menu. An administrator can add a site badge from Advanced settings->Badges->Add a new badge. All other settings are similar to the course badge. ScholarLMS supports several reports and logs to be viewed by administrators, managers, teachers and even students. Some reports are at site level and some are course level. Currently there are several course level reports.These can be accessed by accessing Course administration link of a course. Site level reports can be accessed from the Reports navigation item at the left side. 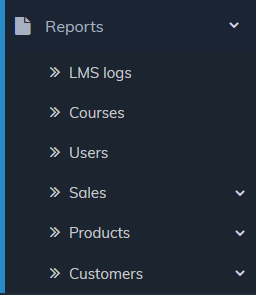 These reports consists of both LMS and your eCommerce store (if enabled). We keep on adding new meaningful reports based on our users’ feedback and demand.